The big news from this morning’s Stage 4 of the Vuelta is the abandon of HTC’s Mark Cavendish. Apparently he was suffering a bit too hard to go on – yesterday’s tweet hinted as much but Cavendish is no stranger to riding himself in shape over the first few days of a Grand Tour. There are a few possible explanations for Cavendish’s abandon: This year’s Vuelta could be just a bit too challenging for him, as it’s loaded up front with some difficult days. He could be uncommitted to any further success while wearing HTC’s colors, as the team is folding after this season. Or, he could be displeased with his role at the Vuelta – on Stage 2 he was the leadout man for teammate John Degenkolb, and after having won a basketfull of stages and the Green Jersey at the Tour, could feel like the Vuelta is small potatoes. After all, he’s the sprinter version of Lance Armstrong – the only wins worth winning are the biggest and best. This puts a serious dent in his preparation for the World Championships in late September. 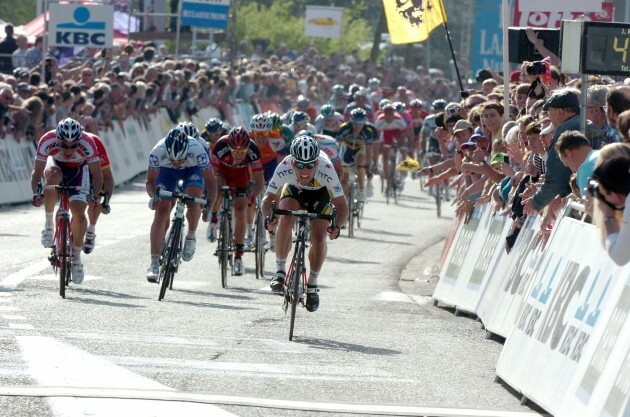 Riders and pundits say that the flattish course in Copenhagen favors sprinters. Were Cavendish’s rainbow stripe ambitions ever serious? Or is this a major setback to a serious goal? And what do you all think were his reasons for abandoning the Vuelta? This entry was posted in Featured, Races and tagged abandon, Cavendish, vuelta, world championships. Bookmark the permalink. Very well-said, Mattio. Cav is a rock star and he thinks so. It is really too bad for the rest of the HTC squad. They staked everything on him, it didn't work out, the team is imploding, and he doesn't seem to bother to want to help other guys find a new job. I'm sure more details will emerge in the coming days, both from Cav himself and also from his teammates and team staff. I don't know if that's a fair comment. Any rider sho has ridden as part of Cavs train in the last three years has seen their market value go up. He's turned Eisel and Renshaw into household names and helped resurrect the careers of riders like Danny Pate. He doesn't think he's a rock star, he knows it and why shouldn't he? I think he just didn't have it at the Vuelta and doesn't want to jeopardise a Worlds oppurtunity on a course profile that only comes around once in a blue moon. It's a long season, to try and ride with purpose from MSR to the World Championships. Mentally, I'm guessing his head just isn't in it. Cav has plenty of racing days (and victories) under his belt season, he doesn't need the Vuelta as prep, in order to be flying at the the World Championships. Damnit Cav! Way to ruin my Velogames squad!! i knew that would piss off lots of velogames' players. i think the lesson here is that cavendish brings his A-game to the TdF and nothing more. everyone wrote him off this year leading into the tour and he comes to france with a haircut and totally fit…he came to work on the biggest stage in cycling. as for the vuelta, he's hot and tired. the worlds are what matters to him. im not mad at him and dont think its disrespectful to the team. the vuelta is for spanish guys and guys who had mistakes at other grand tours…its not for him.